Sometimes dinner turns out pretty dang awesome. 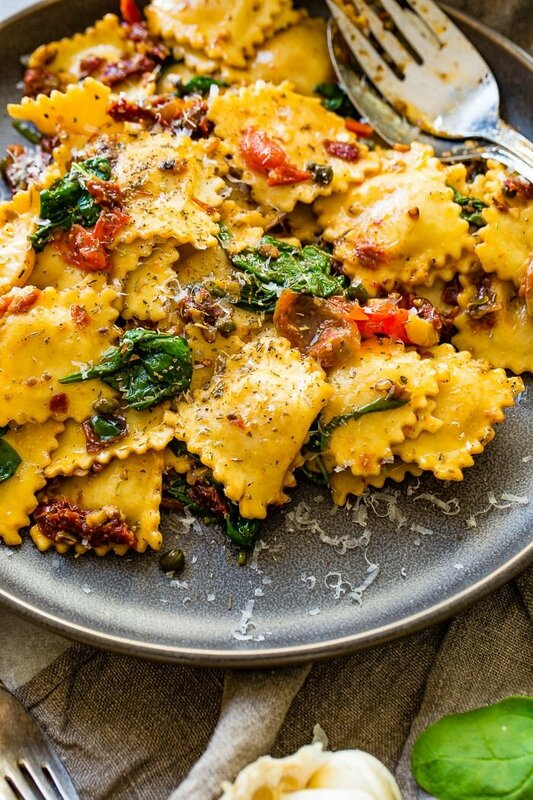 Other times you make Easy Crispy Pancetta Ravioli with Sun Dried Tomatoes and Spinach and angels sing. 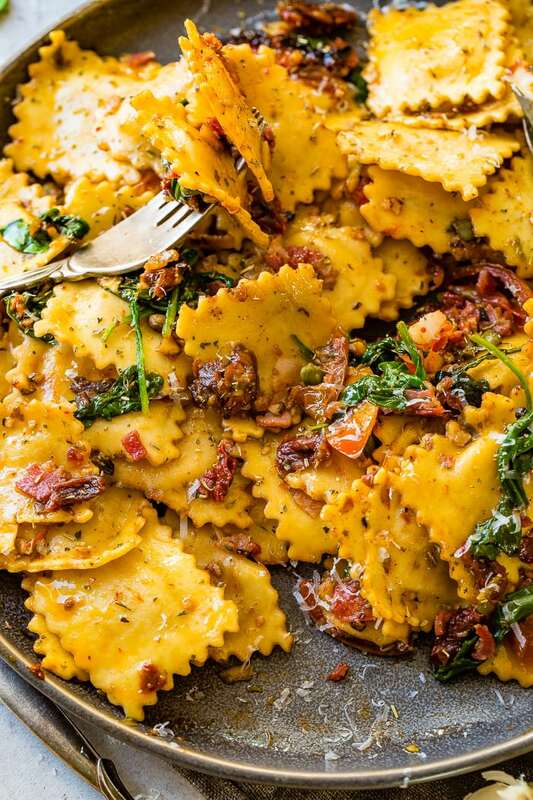 Like literally, the heavens open and angelic voices can be heard for miles around praising your name for the goodness of Easy Crispy Pancetta Ravioli with Sun Dried Tomatoes and Spinach. It’s quick, it requires no real sauce or much prep time at all. And the ingredients list is very versatile so that you can change everything to your needs, or more like your picky eaters’ needs. Because let’s be honest, once you’ve got kids you’re pretty much ruled by what will they eat and what will give me a headache. Unless you’re at our house then it’s, you get what you get, so don’t throw a fit. Well, we don’t say it like that but I certainly don’t make separate meals. This is probably the longest name for any recipe we’ve ever created, but there’s so many good components in this dish, how could we not tell you a little about it just in the title? 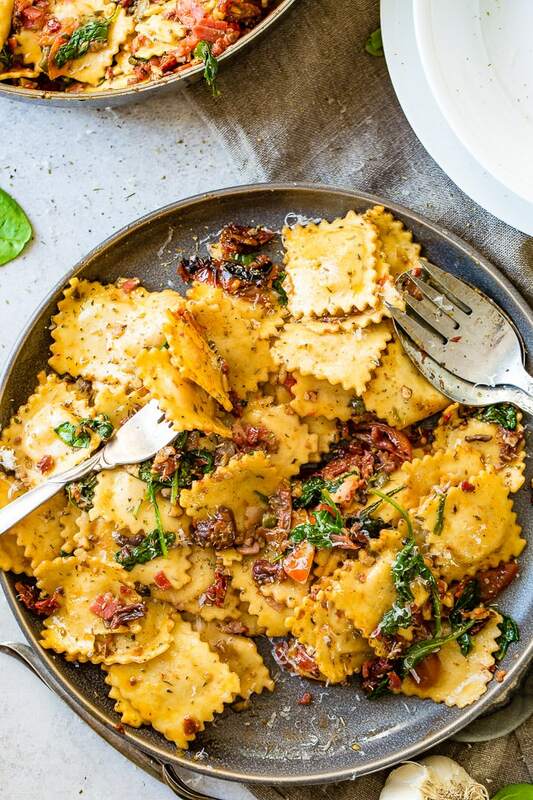 Easy Crispy Pancetta Ravioli with Sun Dried Tomatoes and Spinach starts off with fresh ravioli which we buy at any local grocery store or Costco. 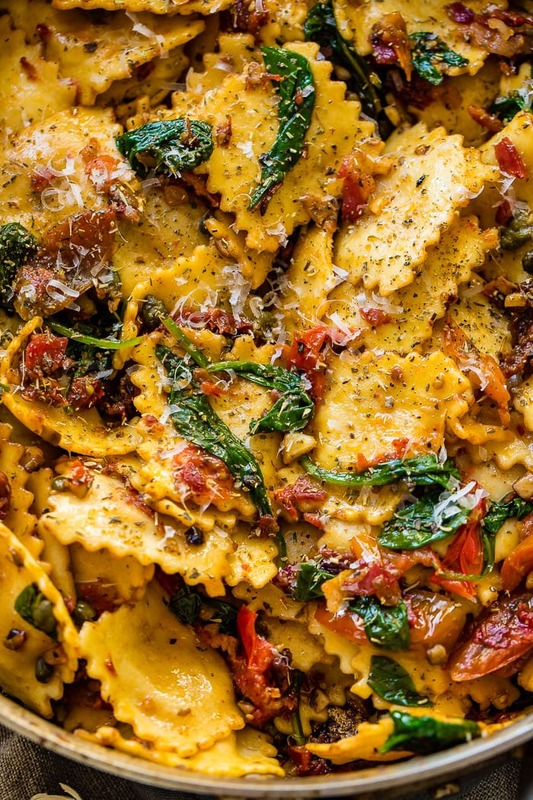 It’s usually just a three or four cheese filled pasta, but the chicken or spinach versions would work fantastic as well. 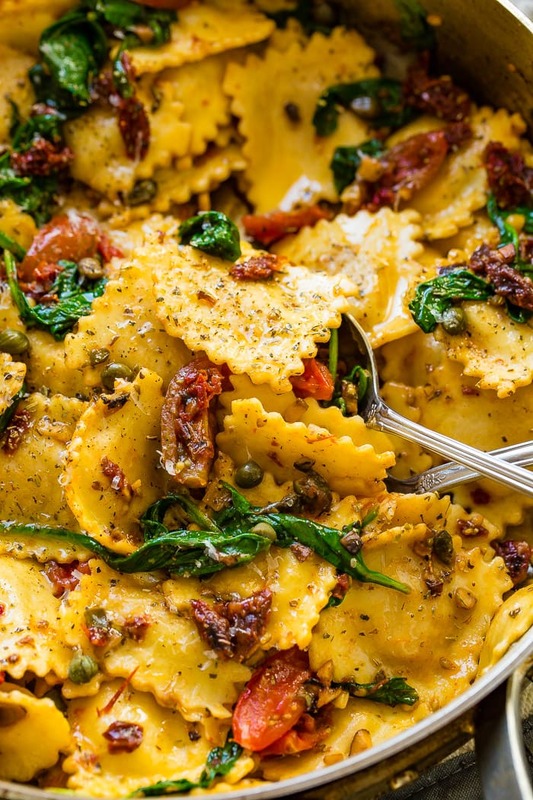 Next, we cook up some simple ingredients like pancetta, garlic capers, tomatoes and spinach and add in the pasta with a little more oil, seasoning and top it all off with some freshly grated parmesan for serving. Both sun-dried tomatoes and fresh are used to brighten up the dish. Can I tell you a little more about some of these ingredients? 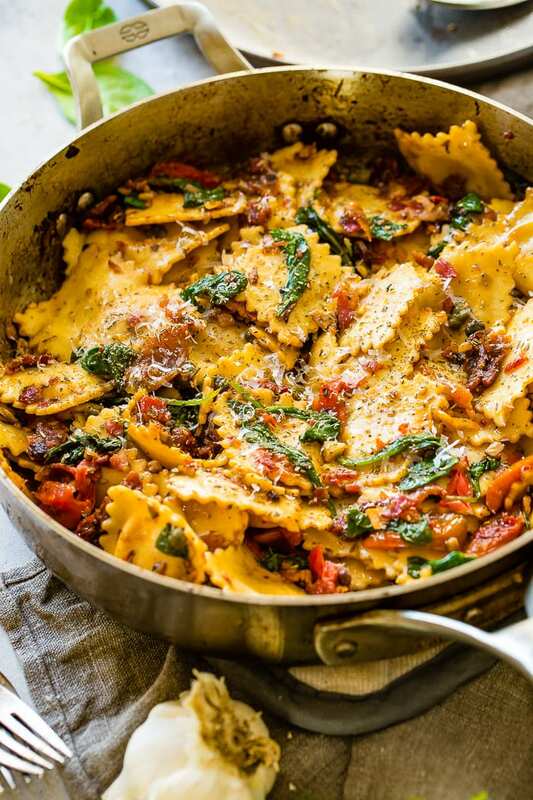 The very first ingredient used for this pasta is pancetta. Pancetta is pork belly meat that has been salt cured, which is why it’s such a salty meat. It is sold in round slices or if you’re lucky you can find it in packages already chopped up. I say that because for a dish like this one where chopping the pancetta is part of the dish you’d might as well save yourself some time! Are Pancetta and Bacon the Same Thing? Pancetta is actually the Italian version of bacon so it’s understandable that they can often be confused for being the same thing. The main difference between pancetta and bacon is how the two are prepared. Italian Pancetta is salted and heavily seasoned with black pepper, rolled up tightly and contained in a casing to hold its shape. Pancetta is cured (the salt on it) but never smoked. Pancetta must be cooked in order to be consumed. Bacon is brined and then smoked to prepare it for market. Hence the names, applewood smoked, hickory smoked and so on. The smoking process for bacon is usually cold, so it’s never actually heated. Bacon must be cooked in order to be consumed. Are Pancetta and Prosciutto the Same? We’ve already gone over pancetta and how it is prepared, but what about prosciutto? Did you think that was the Italian version of bacon? Prosciutto and pancetta often get confused but only because the names at a glance appear to be similar. Prosciutto is not made from pork belly at all like pancetta and bacon. Instead, prosciutto is prepared by taking the meat from the hind leg of the pig, in other words the ham. Prosciutto is cured, usually rubbed on the outside with salt and some seasonings which dries out the meat. This can take months to a few years in order to occur. Prosciutto, because of its dry curing and thin slices does not need to be cooked, but instead can be eaten as is. However, it’s also delicious fried up in a pan, so try that too. We already know my love for sun-dried tomatoes, but just a quick reminder. Unless otherwise stated, please always buy the jars of oil-packed sun dried tomatoes. They are more flavorful and that oil is used on the pasta so don’t buy the dried! Capers are actually unripened flower buds. No lie. You thought you were eating seeds or something similar to olives, huh! Most capers are brined which help to give them a salty flavor that’s great in many different dishes, especially pasta and chicken. 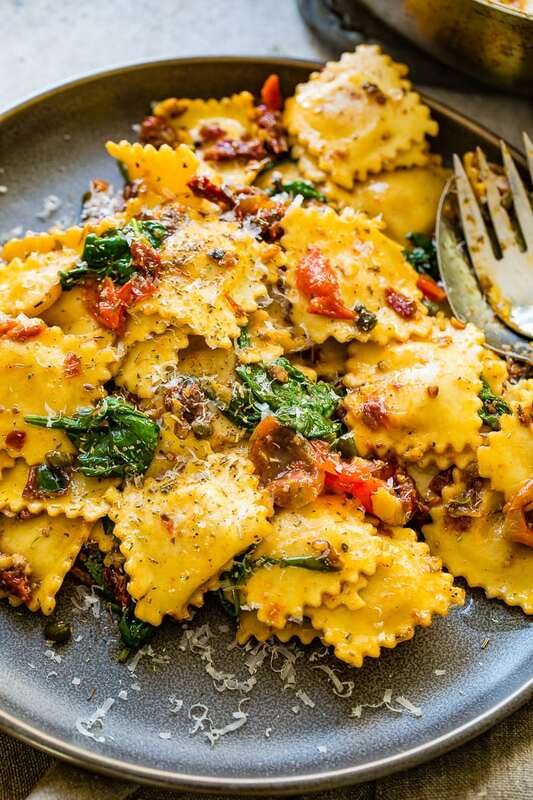 Ravioli is a great pasta for busy weeknights as it’s usually sold fresh which means a much faster cooking time. Bring a pot of water to a boil over medium high heat. Heavily salt the water and then add the pasta. Cook ravioli for 4 minutes if it’s small and thin and up to 9 minutes if it’s very large and filled with a lot of meat and cheese or other ingredients. How Much Ravioli Per Person? You can usually count on around 1/4 pound of ravioli per person. So, a 16 ounce package of ravioli is usually good for about 4 people. This is always dependent on how many people are big eaters though. A small family (1 adults and 3 children) like ours only eats half a package because our kids are such light weight eaters. You can prepare ravioli up to one day ahead, but you should follow a couple of quick rules. Undercook the ravioli by 2 minutes. Cool and store the ravioli in a sealed container or bag. To reheat it, gently warm in a pot of water on the stove until completely warm and cooked. Cook the pasta until al dente and then cool in a dish and cover with plastic wrap. The next day when you’re ready to serve it, heat a little oil in a pan and gently cook the ravioli until hot. How Long Does Ravioli Last? A package of fresh ravioli can last for up to 3 days past the “sell by” date on the package if stored, unopened or in a sealed bag in the fridge. You sure can freeze ravioli! Keep fresh ravioli sealed in its package for up to 3 months in the freezer. Ravioli is usually a fresh pasta, so when you place it in hot, boiling water invisible steam bubbles attach to the ravioli and make them float. This is a great sign that the pasta is or is almost done cooking. Prepare all veggies so you can quickly add everything. Prepare a pot of water over medium high heat. Once it begins to simmer, add a good few pinches of salt so the water is like ocean water. Cook the pasta until it floats to the top and is tender, about 3-5 minutes. Add the pancetta and cook, stirring as needed until crisp. Remove to a paper towel lined plate, leaving any oil in the pan. Add another drizzle of oil if there isn't enough left in the pan. Add the garlic and mushrooms, stirring frequently until tender. Quickly add the capers, sun dried tomatoes, drained pasta, Italian seasoning, tomatoes and spinach. Cook, stirring occasionally until the spinach is wilted. Add the pancetta and parmesan in, stirring to combine and season with pepper, salt if needed. If you’re still looking for another delicious pasta dish, try this chicken pasta!